Yes, the title is correct. Pepsi is going to launch a smartphone. It will only be available in China and it won’t be manufactured by the famous beverage brand. The Pepsi smartphone, dubbed Pepsi P1 will be manufactured by one of the Chinese companies that delivers such devices. The P1 will carry the famous red- white- blue logo and will probably cost somewhere around $200. There is no hint that the P1 will also become available in other regions apart from China. The Pepsi P1 rumors surfaced a few days ago, alongside an image that clearly shows the Pepsi logo on the back of a silver smartphone. But the look of the Pepsi P1 is not the only detail that is now known. The list of specs also surfaced. Now we known that the P1 smartphone will actually be a 5.5- inch phablet. It will feature 1080p resolution and will be powered by a 1.7GHZ MT6592 SoC. It was also stated that the Pepsi P1 will include 2 GB of RAM and 16 GB internal storage. This makes it a mid- range smartphone, which is not that bad for a $200 price tag. It seems that the Pepsi P1 will have at least one more than average feature though. It’s its 3000 mAh battery which is higher capacity than a number of batteries that are sported by high- range devices. 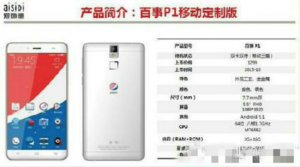 According to the leaked information, the Pepsi P1 will feature a 13 MP rear camera and a 5 MP secondary one. These seem to be the custom cameras nowadays, so Pepsi’s smartphone won’t be in disadvantage camera- wise. Just like the majority of recently released smartphones, the Pepsi smartphone will run on Android 5.1 Lollipop. All of the above information are currently just rumors, but it is possible that an official statement regarding the Pepsi smartphone will be made on October 20. Until then we can only guess whether the Pepsi P1 will actually become reality and whether the list of specs is accurate or not. Ad- Blocking Millennials- Destroyers or Saviours of Online Publishing?